Long after the aspen leaves have fallen in the high country of Colorado, the historic town of Golden still offers outstanding hikes surrounded by vivid shades of yellow, gold, burnt orange, amber, red, and brown. And we’re not just talking about the colors of the craft beer in Golden’s six breweries. The town has 24 miles of trails in an interconnected system, many of them lined with trees that retain their fall colors long into October. Golden’s outstanding location in Clear Creek Valley, surrounded on one side by mesas and on the other side by the foothills of the Rockies, makes it the town where the mountains meet the plains. Combine that with one of the prettiest creekside walks in Colorado and a host of special events – from the Knock Your Boots Off! Beer Tasting and Chili Cook-Off to the Golden Gallop – and there’s no better place to be this autumn than Golden, located just minutes from practically anywhere in metro Denver. 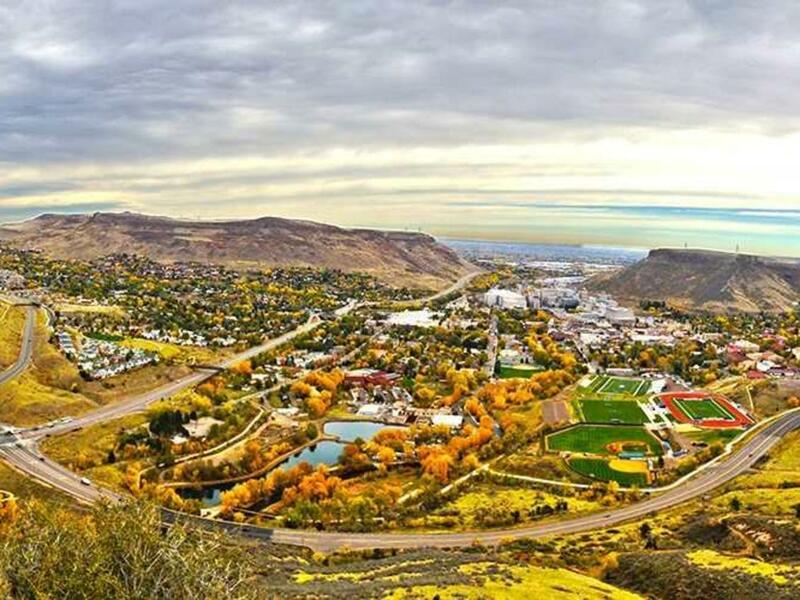 And don’t forget, any trip to Golden for a hike or event comes with an opportunity to enjoy free parking while you stroll the breweries, art galleries, shops, restaurants and museums of historic downtown Golden. Stop by for a bite or a sip, listen to some live music, get in some early Christmas shopping or just enjoy the views. Golden brews more beer than any other town in America. Hike through lovely fall golden colors, then choose you beer from the same array of ambers, yellows and browns at one of the town’s taverns and breweries. Here are some favorites hikes. North Table Mountain Trail takes hikers 1.5 miles along the southwest side of the North Table Mountain below a gorgeous cliff band with excellent views of the Golden valley. This moderate to advanced trail is easily accessible off of Highway 93 just north downtown Golden. Chimney Gulch Trail climbs 2,000 feet in elevation in 2.5 miles, crossing streams and passing through evergreen forests to the summit of Lookout Mountain. Here, moderate or advanced hikers have a choice – continue on to Jefferson County Nature Center to learn more about the flora and fauna of the area, or swing over to Buffalo Bill’s Grave and Museum, to learn about the most famous frontier entertainer in the West. Chimney Gulch Trailhead is accessed via Lookout Mountain Road west of Highway 6. Nightbird Gulch Trail is a 1.8 mile-long dedicated hiking trail that connects to the larger Mount Galbraith Park system and offers challenging terrain with stunning views. This moderate to advanced trail is accessed on Iowa Drive west of Highway 93. Knock Your Boots Off! Beer Tasting and Chili Cook Off Head to beautiful historic downtown Golden on October 15 for the Knock Your Boots Off! Beer Tasting and Chili Cook Off. Attendees have the opportunity to taste more than 70 beers and 50 chilis, while listening to live music. Visit goldencochamber.org for to purchase tickets. Homesteaders Day at the Clear Creek History Park On September 3 and October 1, experience 19th century homesteading, explore the historic cabins and take a lesson at the schoolhouse during the Homesteaders Day at the Clear Creek History Park. The park will be abuzz with all sorts of living history programming, demonstrations and games. Free and open to all ages. YETI Night at AMC The American Mountaineering Museum in downtown Golden hosts the yeti themed Thirsty Thursday on October 20th at 6:00 p.m. Come enjoy beer from Great Divide Brewing Company, live music, gear giveaways by Eddie Bauer and a yeti mask-making station for kids (and crafty adults). Wear your best yeti costume for a chance to win a prize! This annual event is sure to get you in the Halloween mood. The Golden Bicycle Cruise Mark your calendars for the fall Golden Cruise event. Be sure to dress up for the theme of the evening! October 25 - Zombies. Cruisers meet up at 5:30 p.m. at the library parking lot at 10th and Illinois. For more info, check out the Facebook page.